Steve Hoefer returns with another guide to some of the things that make civilized life possible. There are a dizzying number of ways to put a hole in something. Choosing the right way not only means that you get the right hole in the right place, but that you get it with the least amount of trouble and without damaging the material, your tools, or yourself. Just about anything can be drilled, but what you're drilling is the biggest question when picking a bit. Soft materials can be drilled safely with most any bit, but hard or brittle materials like glass or acrylic might require specially designed bits. Accuracy and finish can also affect your choice of bits. Some are designed to produce accurate, clean holes, others are rough, but fast and cheap. The last big choice is what tool you're going to turn the bits with. Some bits are difficult (or dangerous) to use with handheld drills and require a drill press. Others are easy enough to use with hand or even hand-powered drills. Virtually all drill bits are designed to spin clockwise, which isn't a problem on a drill press, but many hand drivers are reversible, so if it's spinning but not cutting, make sure you're going the right direction. Also make sure the shank of the bit (the end opposite the cutting end) will fit in your drill chuck. Chucks come in 1/4", 3/8" and 1/2", which is the maximum diameter of shank that will fit inside. 3/8" is a good general purpose size, and most large bits have reduced shafts to fit in a 3/8" chuck. Shanks commonly come in round or hexagon shapes. Round shanks center more reliably than hex, but hex shanks are less likely to slip and are better for drilling hard materials. Before you start drilling be sure to fully tighten the bit in the drill chuck and make sure it's straight or you'll quickly break the bit. The quickest way to check if it's straight is to run the drill without drilling a hole. The bit should stay straight as it spins and not wobble or turn into a blurry cone. If you're sure it's chucked right, the bit might be bent and should be discarded. Mind the speed of the drill on hard materials with large bits which can heat to the point where it will stop cutting and can burn, melt, or otherwise damage what you're drilling. It's impossible to go too slow to be safe, but most drills don't provide much power at low speeds. A 1/2" bit cutting hard steel should turn around 500 RPM while a 1/8" bit in wood can go up to 10,000 RPM without problems. A good rule of thumb is: If it starts spitting out smoke or discolored chips, slow down. Use cutting oil when drilling metal, which will not only lubricates and cool the bit, but help remove chips. You won't typically need more than a few drops per hole and it will dramatically improve the life of the bit. The most common type of drill bit and the most general purpose. It has a pointy end and a spiral groove (called a flute) to help cary chaff out of the hole. They're so popular because they work in a wide range of materials and come in sizes from a fraction of a millimeter up to multiple inches. The main difference between them is the quality and coating of the steel. From softest to hardest are Steel, High Speed Steel, Carbite Tipped, and Cobalt steel. Harder bits are not only better at drilling through harder materials, but will stay sharper longer when drilling softer materials. Plain steel bits really only useful in soft woods. Cobalt steel bits are heat resistant and particularly good for drilling hard metals, though they're brittle and should be handled carefully. Bits often have coatings to improve their performance. Black oxide mostly lubricates and prevents rust, while titanium coatings improve the hardness and heat resistance. However the coatings are thin and once they've worn off you're left with an ordinary bit. Sharpening them just removes this coating, and they'll never get return to their original performance. The points of the bit come in two styles. Spade points are the most common and require the bit to be pressed into the material before it starts to cut. On hard surfaces like metal this can mean it will skate around before making a hole, which will often put the hole in the wrong place. This can be minimized by using a center punch or drilling a pilot hole to mark the hole, but split tip (aka: pilot point) bits reduce wandering and eliminate the need to punch or drill a pilot hole. When drilling deep holes in soft materials be sure to occasionally pull the bit out and clear the flutes. Otherwise the flutes will get packed with chaff, and it will stop cutting. Good in just about any material. Common and usually pretty cheap. Can be sharpened when dull. Available in just about any size. Small bits break easily. Large bits are very expensive. They dull quickly in certain materials. Small flutes mean they can fill with chaff when cutting soft material. Spade bits (sometimes called paddle bits) have a simple design intended for ripping quick holes through wood and other soft material. Spade tip in the center helps keep the bit on target, but it's the nature of these bits to splinter out the back side of the hole when they cut through. They require more torque than a twist bit, so if you're using them with a hand drill be sure to hold on tight. Their simple construction means they're easy to sharpen and cost less than other bits. They're readily available in lengths of at least a foot. Long bits are handy for drilling extra deep holes or in hard to reach places. 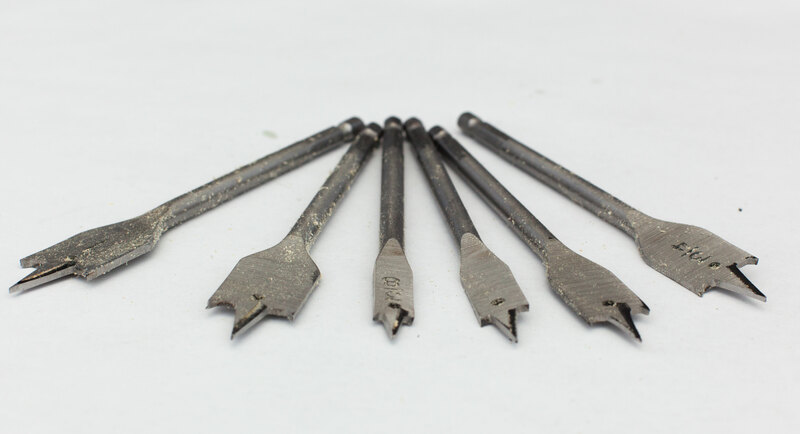 Many spade bits have a hole near the tip to pull wire back through the hole after drilling through floors and walls. Quickly cuts through soft wood. Works well in hand drills. Cheap. Only really useful on soft woods. Leaves a ragged hole. Hard to start an angled hole. Lack of flutes mean deep holes can fill with chaff. Rough construction. Making holes in studs, joists and walls to run cables. Any other time you need a quick hole in wood and don't care how it looks. These are similar to twist bits, but they have a large single flute to remove chips and a screw tip to help get it started and stay centered. They have a lot on common with spade bits. They are made for wood and other soft materials, they can be readily sharpened, and are usually long. But unlike spade bits they leave neater holes and require much less torque to turn. In fact they turn so easily they were the first choice back when hand powered drills were popular. They're also better at drilling deep holes because the large flute easily removes the waste material from the hole. However those improvements make them more expensive than spade bits.of the same size. Better at removing material than a twist bit. Smoother holes and less blowout than a spade bit. Limited to soft materials and holes 1/4" to 1-1/2" in diameter. Drilling medium-sized and/or deep holes in wood. Drilling with a hand brace. 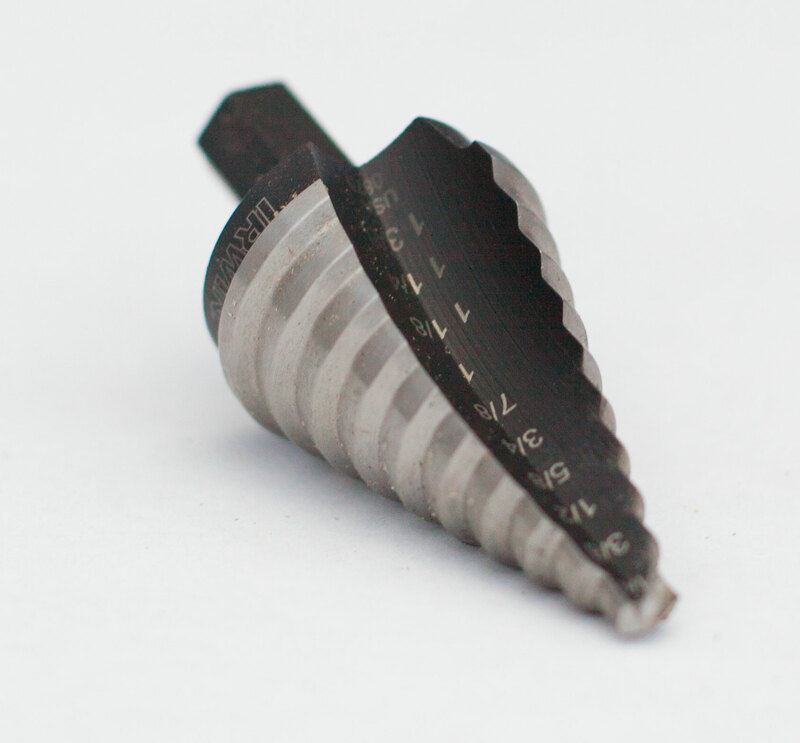 Forstner bits are flat bottomed with a point in the center to keep it on target. They tend to be expensive, but provide high precision and finest finish of any drill bit. 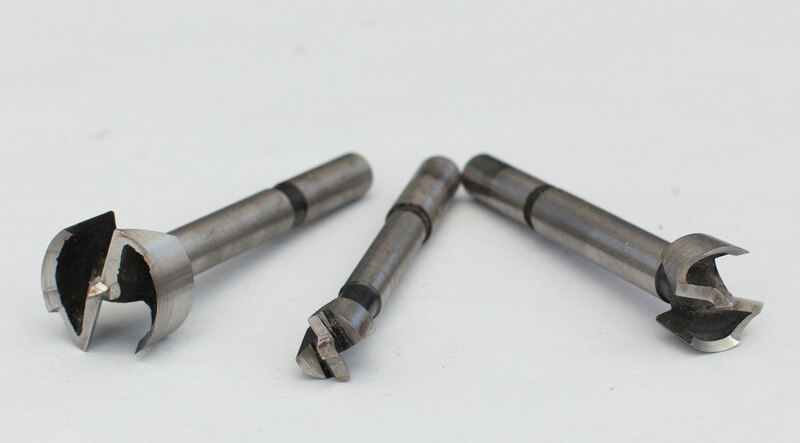 Unlike most bits which simply have a cutting edge on the bottom, Forstner bits cut two ways at once. First a blade around the outside keeps the hole from splintering, then a set of blades parallel to the surface shave off the material as they're pressed into it. Because of the way they work they cut holes with extremely smooth sides and flat bottoms, which makes them attractive for many woodworking projects. However they also require a lot of pressure to make them cut, and bits bigger than 3/4" require a drill press. Flat bottom holes. Smooth-walled cuts. Sizes from 1/4" to 3". Limited to wood and similar soft materials. Larger bits require a drill press. Expensive. Woodworking projects where the holes will be visible. Where precise, large, or flat bottom holes are necessary. These get their name from their stair-stepped profile. They tend to be expensive, but a single bit can cut many different sized holes. The deeper you drill the bigger hole you get. They're typically labeled by the minimum and maximum size of holes they can cut, and the increment between the steps. (i.e. : "1/4in to 1-3/8in with 1/8in increments"). The size of the hole is typically inside the flute at each step. They're peerless for drilling precise holes in sheet metal. The straight flute prevents the bit from deforming the metal as it cuts through. (The spiral flutes on twist bits often grab and pucker sheet steels when cutting larger holes.) They're accurate and quick, allowing you to drill many different size holes without changing a bit, and by lowering the bit to touch the beginning of the next step you can easily produce a perfectly deburred (smooth edged) hole. The most obvious limitation of step bits is that they only work on material thinner than the individual steps on the bit, usually 3/16" or so. That limits it to sheet metal, plastics, and laminates. The bits are also difficult to sharpen and the smaller sizes (lower steps) of the bit will go dull before the larger sizes further up. Some step bits have a blunt end and require you to drill a pilot hole the size of the first step before you can use it. When cutting metal be sure to use cutting fluid to extend the life of the bit. One bit cuts many sizes of holes. Clean, precise cuts. Only for thin material. Difficult to sharpen without ruining the accuracy of the bit. Cutting neat holes in thin sheet material, like control panels, project cases, and linoleum. These are literally a saw blade bent into a circle, with a twist bit in the middle to help keep it centered. Unlike other bits they don't chip away the material, they only cut around the outside, leaving a plug of solid material in the center. Since they're not removing as much material they don't need as much pressure as a Forstner bit the same size. They cut neat holes with minimal splintering on the back. For very clean back sides, stop cutting when the pilot bit comes through the back, then move the drill to the back side and finish the cut from there. Hole saws have a removable mandril that includes a twist bit, the shank that fits into the drill, and an attachment point for the outer saw. This lets different sized hole saws to be affordably swapped out and dull ones replaced. They're commonly available in sides from 1/2" to 6" diameter. If you're using a hand drill hold on tight; they tend to grip hard and bind easily, which can twist the drill right out of your hands. Drilling a pilot hole the same size as the mandrel bit can help keep it under control, and it's important to keep the bit parallel to the surface. Bimetal blades can even be used to cut soft metals up to about 1/4" thick, and diamond grit saws can cut masonry. Can cut large precise circles with minimal effort. Have to cut all the way through the material to get a hole. Limited to thinner materials. Plugs often get stuck inside the bit. Making holes in doors for locks. Cutting holes in drywall for lights or other installations. Making holes in joists for plumbing. There are a lot of specialty bits that aren't covered here. Like most specialty tools they're really only good for their stated purpose, so don't try to use a concrete bit for acrylic (or vice versa). On the other hand they often perform very well at their job. Masonry can quickly destroy general purpose bits, and general purpose bits can easily melt or crack acrylic. For drilling wood and metal the above choices will work well, but don't be afraid of a specialty bit if you're faced with a difficult material.